Support layer: It is the primary layer forming the core of the mattress. It is this layer which gives main support to your back. It can be made of High density Rebonded foam, Springs or High-density foam. Comfort layer: This is the secondary layer which adds comfort to your mattress. The comfort layer adds the desired firmness and cushioning. If someone is looking for a firm mattress, a comfort layer of a firm foam will be added to the primary layer. If someone is looking for a medium-firm mattress then a memory foam layer or a soft foam can be added. 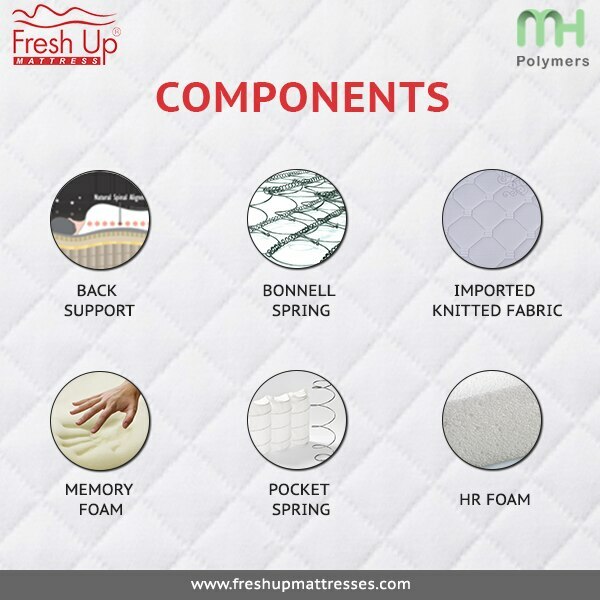 Comfort layer in a mattress ensures that your body’s areas such as shoulder, back and hips can be cushioned, so that these areas don’t feel the pain. A comfort layer can be as many in the mattress, they add the thickness to the mattress. Fabric: A quilted fabric also acts as a comfort layer. A plush quitting of foam and memory foam adds further to the comfort. A soft breathable fabric gives a rich feel to the mattress.